C&M Conveyor has many years of experience designing, building and installing conveyor systems for the folding carton industry. We provide application-engineered systems that meet the specifications of each machine. We design systems that protect the operator, safeguard equipment and reduce downtime. We understand and address complex issues from pallet selection through the entire workflow process. For sheetfeed-press infeed applications, we provide conveyor systems for staging and auto delivery of full pallets of sheeted material. Our system can be set up for auto delivery, non-stop or manual operation. 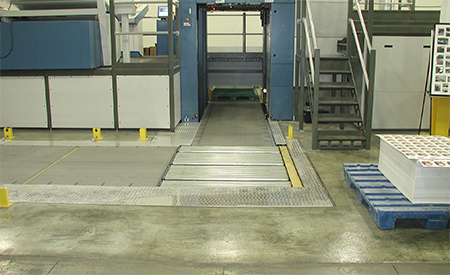 For discharge applications, we provide conveyor systems for auto delivery of empty pallets to the machine discharge to be loaded; full pallet staged for non-stop operation. For die cutter infeed applications, we provide conveyor systems for staging and auto delivery of full pallets of sheeted material. Our system can be set up for auto delivery, non-stop operation or manual operation. For sheeter outfeed applications, we provide conveyor systems for auto delivery of empty pallets to the machine discharge to be loaded; full pallet staged for non-stop operation.